Retro relaxed Wedding for 100 Guests. Rustic-Chic interior with amazing views. Outdoor space for fun and sun. Arriving guests are in no doubt this is an informal affair with some treats in store. Peaked Roofs poke the sky. Pure white interiors backdrop whatever theme or mood you wish. Strong shapes and unfussy interiors create a space which can stand alone or be dressed to your taste. We can provide furniture to compliment your vision from our extensive stock. Custom floorplan showing 3 Hex marquees with Diamond bar space and Square catering area. Big open spaces. Party day and night. Make it your own. All under one roof. If the sun shines (or even if it just stops raining) throw the walls open and let the inside out. Lots of shapes and space make zoning easy and fun. Everyone together or in their own themed space. 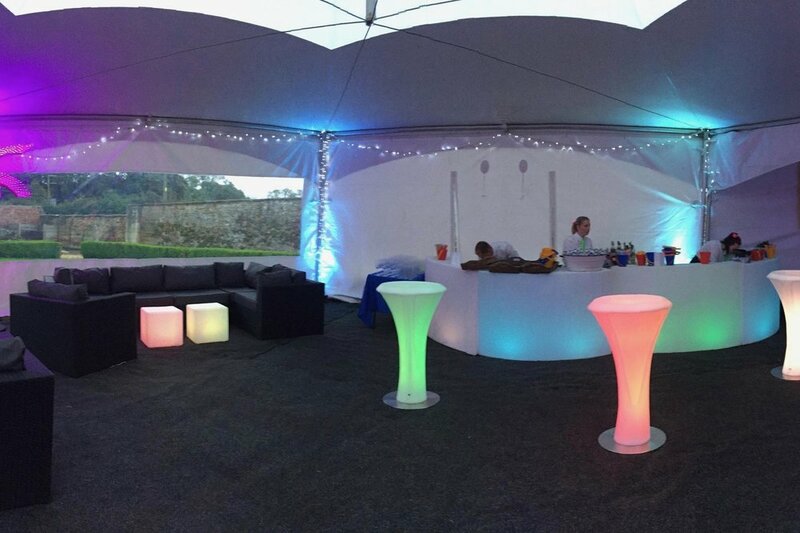 Our LED furniture creates a fantastic destination bar area. We can bring endless furniture and lighting options to the party. School Ball for 250 guests. A spacious and bright contemporary venue was created to hold this prestigious schools key annual event. For the third consecutive year we delivered Wow. Lots of space for 250 guests to mingle, dine and dance. 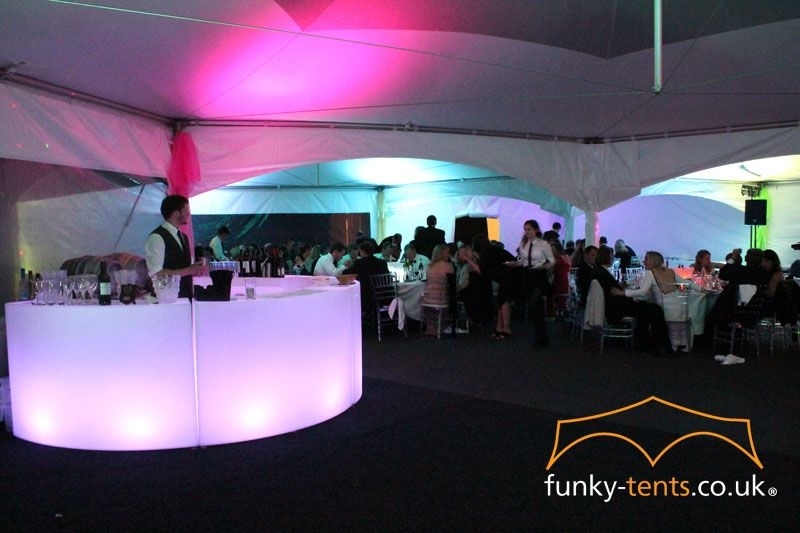 4 linked Hexagonal Marquees create the main venue. Squares at each end keep caterers happy and out of sight. Opaque Skylight roofs and full width panoramic windows create a bright daytime interior. At night the roles reverse as LED uplighters and furniture put on a show of their own. As much space as you need. Hexagonal, Diamond and Square structures can be joined in infinite ways to create whatever space you need. Bars, Chill Out, Dance, Dining, Reception. Just ask. 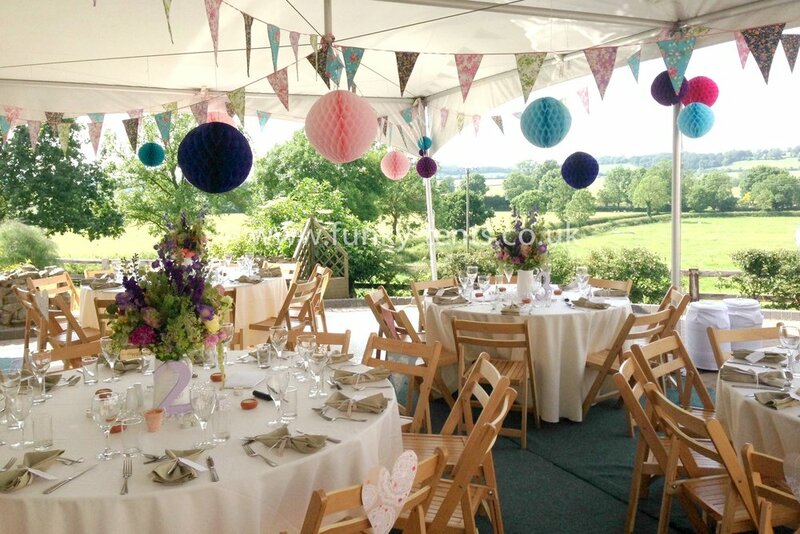 We’ve helped these people deliver successful marquee events. Let’s explore how we can do the same for you. We connect with these guys too. A useful and easy to use resource for finding a wide variety of suppliers. Useful search tool for local business across all sectors.